A triumph in our ongoing war against cancer. Approximately 20 percent of all cancers have a mutation that makes them incredibly resistant to chemotherapy – a gene called KRAS. KRAS-mutant cancers also have very low survival rates because they are much harder to treat. 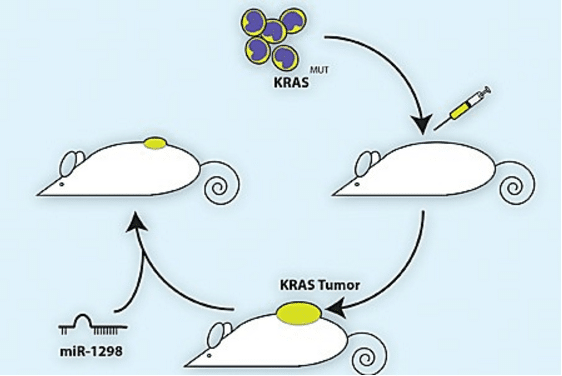 Given this, researchers have focused their efforts on ways to inhibit KRAS activity. But scientists from the University of California San Diego School of Medicine alongside Moores Cancer Center have taken a unique approach that may prove to be more effective. “Instead of trying to deter KRAS itself, we took the approach of looking for other molecules that, when inhibited, are lethal to cells only when KRAS is also mutated,” said Tariq Rana, PhD, professor of pediatrics at UC San Diego School of Medicine and Moores Cancer Center who is the senior author of the study. The new study, published October 3 in Cancer Research, focuses on inhibiting other genes to create combinations lethal to cancer cells driven by a KRAS mutation. For the study, researchers used microRNAs – which normal cells use to control what genes are turned on or off, and are less active in cancer cells. They found that one microRNA, miR-1298, could effectively suppress KRAS-dependent cell growth in colorectal and lung cancer cells. Basically miR-1298 was able to inhibit the growth of two specific proteins in cancer cells—FAK and LAMB3, which in turn, led to KRAS-driven cancer cells to stop growing. Using a mouse model, Tariq Rana, PhD, and colleagues discovered microRNA miR-1298 specifically kills cancer cells with a common mutation in the KRAS gene. Their findings revealed microRNAs as relevant tools for possibly identifying therapeutic methods of treating cancer in the future. To date, traditional methods of killing cancer cells are toxic and harmful to healthy cells. This study points us to a specific target instead, higlighting how LAMB3 can be used as a prognostic biomarker, where efforts to eliminate KRAS-driven cancers can be centralized, thus minimizing dangerous effects to the rest of the body.